We wanted to help people with ALS have an easier experience while working at the computer. 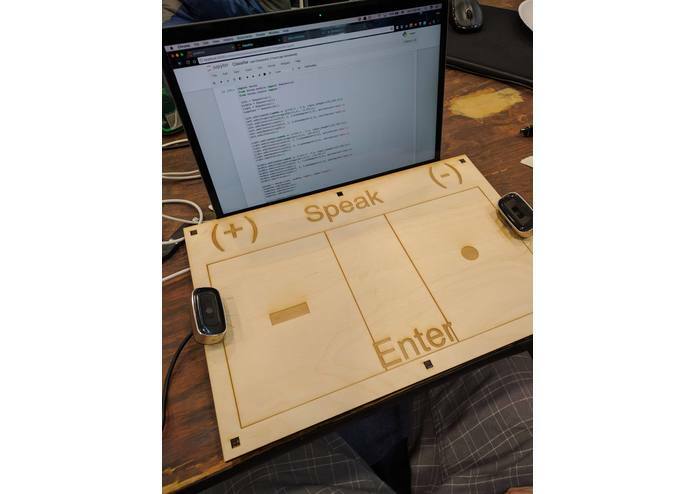 It maps eye movement onto a virtual board that can type letters. We built it with neural networks closely related to the LeNet architecture. There was a lot of pre and post processing to get the 3 cameras to work together as well as getting the output to a working speech generator. The model was trained on an AWS EC2 instance. Lack of data due to not enough time made this more of a proof of concept rather than a full working prototype. The final product looks amazing and the code architecture works swimmingly. Collecting data is very hard. We also learned a lot about neural networks. To gather more data and make a fully working prototype. I worked on the back end like the neural networks and image pre-processing. I also built the hardware. Worked intensively on ironing out the data collection methods and assisted in minor code cleanup. I worked on the front end of the project, which converted the Morse code to actual text. I also did a lot of the data training for the neural network.